Last season, the Portland Trail Blazers used a 13-game winning streak to finish third in the Western Conference standings. They also had losing streaks of five games, four games (which came in the final two weeks of the regular season) and three of three games. In short, while it qualified as a successful regular season campaign, one in which Portland finished with 49 wins, it was also rather volatile. Being swept by the New Orleans Pelicans in the first round of the 2018 Playoffs served to prove that point. That has not been the case this season. Portland never lost more than three consecutive games in 2018-19, and what’s more, they only lost three straight twice. They also never won more than six games in a row, and yet, they finished with four more wins than the season before to once again claim the three-seed in the West. The highs and lows that typified the 2017-18 season were replaced by relative calm, even with CJ McCollum missing significant time due to injury and Jusuf Nurkic’s season ending with a gruesome leg break. But what we don’t yet know is if those calm waters will carry over to Portland’s first round matchup versus the Oklahoma City Thunder, a team that swept the season series 4-0, in the 2019 Western Conference Playoff edition of the three-six matchup. While the Thunder don’t enter the 2019 Playoffs having lost their last 10 games in the postseason as the Trail Blazers do, they are also a team that has won a total of three games over the course of two first-round series since Kevin Durant bolted for the Golden State Warriors in free agency. So while every team is desperate to advance, their might not be two teams whose futures are dictated more by success or failure in the 2019 Playoffs than the Trail Blazers and Thunder. The same could probably be said for the perceptions of both Damian Lillard and Russell Westbrook, two of the most elite guards in the NBA who have have also failed to make it to the second round as the unquestioned leader of their respective teams. With Game One scheduled for Sunday at 12:30 p.m. at the Moda Center, let’s look at the matchup between the Thunder and Trail Blazers, two teams that have never met in the postseason. "It’s weird because me and him, we actually real cool once we get off the court. When I see him in public, we speak. ‘How the family? How your kids?’ But then there’s just something about it when you get on the court. That’s what it is. He’s one of the top point guards in the league and so am I. When you get out there and you know that your team is going to go as you go, he has to outplay me and I have to outplay him if I want my team to win, so that’s just what it turns into. But off the court, we cool. I know Russ, I know PG. They cool but once you get out there, that’s what we do. This is our jobs. We coming out here to win and we on opposite sides. I think you just try to make his life hard. Obviously with a lot of the better players in the league, he gonna have plenty opportunity, so that makes it hard to just stop a guy from doing what he does because he gonna have the opportunity to take shots, the ball is always going to be in our hands. It’s hard to completely stop but I think it’s just a matter of making it a hard night. That’s what our job is defensively against him, against Paul George. Just got to make it a tough night for him." "I feel good, I feel like I’m ready to play, looking forward to the playoffs. I’m glad I was able to get back and get a couple of games in, get a few game minutes in before the playoffs start… My wind is fine, no minutes restrictions." "I always feel like I have an advantage at (my position). That’s how you have to be. You have to be confident in your abilities and understand who you are as a player. Obviously they’re a good team, they bring a lot of different dimensions, but I like our chances and I like my chances every night." "We’ve got to come ready to play from the beginning, we’ve got to come out and set the tone how we want to play. We can’t expect anything. We’ve got to come in hungry, ready to go, locked in, focused because it’s going to be a tough, tough series no matter what. We’ve going to have to go in there, be locked in, be ready to go for the physicality, for the intensity of a game." "It’s tough. You’ve got to try to just contain him, make it hard for him. He’s a great player, he uses the pick and roll really well, he’s been shooting the three ball really well this year. You got to figure out what you gonna do, how we gonna guard him in those pick and roll situations. And then one-on-one, you kinda gotta nut up and guard in that situation." "It’s should be a good matchup. I like the matchup, for sure. Usually when you get to this point of the year it’s going to be a good matchup, good team. It should be exciting, it should be fun, Im looking forward to it for sure." "Obviously you just try to throw different bodies at him, different things like that so that, therefore, you wear him down physically. He’s a great player and knowing going in making it difficult on him is going to be a key to being successful for us." "We are very excited, it should be fun. I think we should feel blessed to be here. I joined this team in February but the whole team working really hard the whole season to get here. I think we finished the season pretty good, so now is the fun part. Playoffs, you win or you go home." "He’s definitely one of the post defenders I’ve seen. I remember me and him used to go against each other a lot in practice. It wasn’t basketball, it was like wrestling. You could almost here the bones cracking. It should definitely be fun because I know his game, he knows my game. It’s going to definitely be a fun matchup." Jusuf Nurkic (left leg) is out for the postseason. Andre Roberson (left knee) is out for the postseason. Despite playing the second night of a back-to-back after arriving in Oklahoma City well after 3 a.m., the Trail Blazers overcame a slow start, thanks in large part to seven offensive rebounds, to go into the second quarter Tuesday night tied at 25-25. But cracks formed early in the second quarter, with the Thunder turning six turnovers into nine points in the second quarter. So despite shooting 50 percent from the field in the second quarter, Portland entered the intermission trailing 62-55. Much like a night before, the Trail Blazers got a huge individual third-quarter performance to keep the team afloat in a hostile road environment. But this time it was McCollum, rather than Jusuf Nurkić, who came on strong immediately following the half. The 6-4 guard out of Lehigh went 7-of-9 from the field, 5-of-6 from three and 2-of-2 from the free throw line for 21 of Portland's 32 points in the third quarter. Behind McCollum, Portland was able to keep the game relatively close at 93-87 going into the fourth. "I just tried to be aggressive," said McCollum. "Tried to take advantage of pindowns, flares, read the defense, really take advantage of some movement without the ball. They did a good job of setting screens, Dame did a good job of recognizing some of the movement sets that put me in a position to have an advantage." After deferring to McCollum in the third, Lillard looked for his own in the fourth, going 5-of-7 from the field and 3-of-3 from the free throw line for 14 point. But the Trail Blazers never had an answer for either Paul George or Russell Westbrook, with the All-Star duo combining for 21 points in the fourth. "Paul George is a great player," said Stotts. "Last time we played him he had two points in the fourth quarter with that matchup, and that's the matchup I went with this time. (Westbrook)'s a dynamic player, and he had a good game obviously, but I thought the difference was Paul George. He kept the second unit alive. The way they rotated when he was in there with the bench guys against our bench and he really carried them over those stretches." Trailing by as many as 12 points early in the fourth quarter, Portland climbed to within three, 109-106, with five minutes to play. But the Blazers couldn’t recover from costly turnovers that led to fastbreak points for the Thunder in the final minutes, resulting in the home team pulling away for the nine-point victory. After the first half of Friday night’s contest, it looked as though the Trail Blazers had a great chance to extend their streak against the Thunder behind strong performances from Damian Lillard and Jusuf Nurkic. Lillard put up 13 points on 5-of-9 shooting from the field while handing out five assists in 17 first-half minutes, while Nurkić followed up his historic performance two nights before in Sacramento with 16 points on 8-of-9 shooting, four rebounds, an assist, a steal and a block in 15 minutes. Add in Jake Layman, playing meaningful minutes for the fist time in over two weeks, going 4-of-5 from the field for nine points in seven minutes, and Portland took a 62-57 lead into the intermission. But the fact that the Trail Blazers played a great first half, with the team shooting 52 percent from the field and only turning the ball over six times for five Oklahoma City points, and only lead by five at the half was a sign of things to come in the second half. So too was Thunder forward Paul George going for 21 points in the first half. Oklahoma City chipped away at the lead for the majority of the third, finally taking their first lead since early in the first quarter at 86-85 on a Paul George three with 1:51 to play in the quarter. Portland would take the lead back, but Oklahoma City finished the quarter on a 10-2 run, helped along by back-to-back turnovers from Damian Lillard, to take a 93-87 lead into the fourth quarter. After trading baskets for the first half of the fourth, the Thunder took their largest lead of the night at at 107-97 after a Westbrook 18-footer with 4:13 to play in regulation. The Trail Blazers had one last push left, going on a 10-2 run, with all of those points coming from the free throw line, to cut the Thunder lead to 109-107 with 42.8 seconds to play. 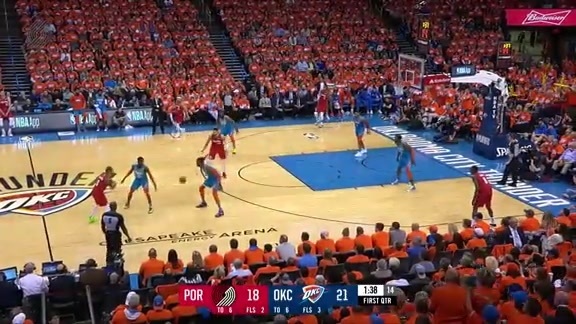 Westbrook missing a mid-range jumper on the ensuing possession, with Al-Farouq Aminu grabbing the rebound and giving the Trail Blazers a chance to tie or take the league with just over 22 seconds to play. Aminu would get another rebound, this one on the offensive end, after Lillard missed a runner with 11.3 seconds to play, to give CJ McCollum a chance to send the game to overtime. But McCollum’s long two pointer missed short and Oklahoma City corralled the rebound with 4.3 seconds to play. “It was a late run," said Lillard. "We needed to probably make every shot and get every stop. Those are tough situations to come back from and we just came up short. We had plenty of opportunity, I missed one of my last of those three free throws. We still had another chance, I came down and missed a floater off the glass. With everything that happened and how hard we made it for ourselves, we still had an opportunity at the end of the game, just didn’t come up on the right side of it." Playing inspired against two of the NBA’s premier big men from the tip, Jusuf Nurkić scored 11 points on 5-of-5 shooting from the field. Nurkić’s efforts, however, were bested by Jrue Holiday’s 12 points to put the Pelicans up 31-25 after one. Despite a 31-10 led by Holiday and Davis through the midway points of the first and second quarters that Portland trail by 16, the Blazers traded momentum with a 30-14 run of their own to end the first half and go into the break tied at 61 behind Lillard’s 13 second-quarter points. The second half brought a more even-keeled affair, but it was the Pelicans’ shooting on their home court that decided the game. The Blazers had no answer on the defensive end for the Pelicans big man duo of Davis and Cousins, as the two combined for 32 second-half points A 6-2 New Orleans run from the 4:43 mark to the 2:04 mark in the fourth quarter gave the home side a six-point advantage that the Blazers could not overcome in the end. With the Blazers and Thunder entering Thursday's game tied for third in the West, neither team gave an inch over the course of four quarters. The lead changed hands 23 times, the game was tied on 16 occasions and neither team led by more than seven points in regulation. Throw in three technicals, a flagrant, an ejection and 58 combined personal fouls and Thursday's game was obviously one that both teams valued. “It’s a playoff atmosphere," said Damian Lillard. "We know that’s a team that’s going to be in the postseason, we’re going to be in the postseason – a division opponent. Every time we’ve played them over the years, it’s been pretty much a war – physical, close games, chippy. This one was no different." After an incredibly tight game for 47 minutes, it was only fair that Thursday's game should go to overtime. That almost didn't happen, as Skal Labissiere, selected by the Thunder to shoot free throws in place of Jusuf Nurkic, who was ejected for picking up his second technical with 4.4 seconds to play in regulation, missed two free throws that would have tied the game. 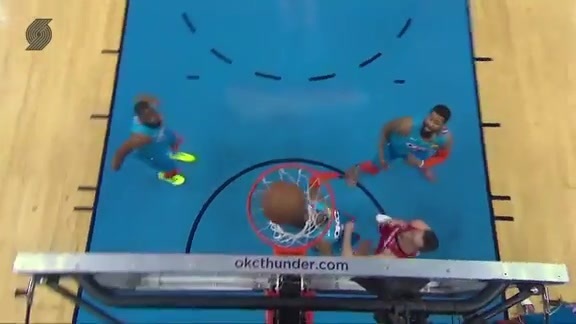 But the Thunder were called for a foul on the ensuing scramble for the rebound, giving Al-Farouq Aminu two free throws, which he would make to tie the game at 113-113. The Blazers would have a chance to win the game in regulation after Russell Westbrook turned the ball over with 1.9 seconds to play, though Lillard's half-court attempt was well off, sending the game to extra time. In the end, the difference would eight points in the overtime from Westbrook. With the Blazers making just two of their nine attempts and the former MVP scoring eight points on 2-of-3 shooting from the field and 3-of-4 shooting from the free throw line, Oklahoma City was able to pull away for their fourth victory versus Portland in as many tries this season.